Hello we are two french guys who purchased this wonderful Campervan now 5 months ago and we need to sell it now to continue our journey in Australia. 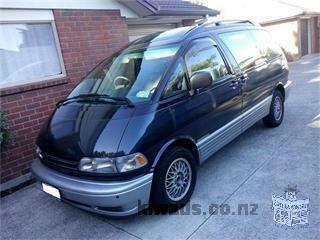 It is an ideal van for 2 people, comes with all the necessary equipment on board. The van is fully eqquiped and it is pleasant to live in! We kept it until now and we never had a problem with. It is a reliable vehicle and you will see pass landscapes without seeing pass kilometres! - in brief what it takes for you cook and eat good dish. - 2 holding of dives, Palm, mask. The Van is available now in Christchurch. Type : "Motor-home, Camper Van and RVs"
Making your flooring and concrete work beautiful by using all the latest methods including Spray Crete we provide excellent services in Gold Coast. we sell all kind of Musical intrsument .also now in stock the 3 combined Brand New Cdj 2000 nexus + 1 djm mixer 2000 nexus with head phone 2000 Are you interested? Automatic box. Laser reader, air-conditioner, speed regulator, tilting wheel, gr. dial, panes lockings and mirrors electric, impeccable mags, interior and outside. Toyota Town Ace Campervan – Perfect for Road trip. Online shopping fashion is a way to get the fashion items you desire most easily to your doorstep, The cocoanddawn.co.nz is a big online store for your fashion clothing . Glorious food Specialises in the crafting of handmade cakes and relishes,Catering.Glorious Food Cakes and relishes can be delivered in Canterbury and its surrounding areas. New Released: Apple Iphone 6/6 +/Samsung Galaxy S5/ Blackberry Z10/ Q10.